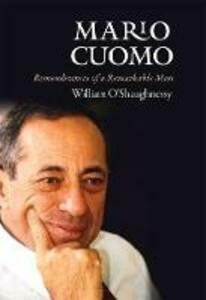 Governor Mario Cuomo's life and accomplishments are part of the public record, but in Mario Cuomo: Remembrances of a Remarkable Man, William O'Shaughnessy gives readers an exclusive and a deeply personal, behind-the-scenes look at the liberal Democratic icon. This poignant memoir, based on the author's thirty-eight-year friendship with Governor Cuomo, portrays the spiritual journey of a man who played many roles: inspirational political leader, moral compass, spellbinding orator, gifted author, legal scholar, and loving father and grandfather. He was, in O'Shaughnessy's words, one of the most articulate and graceful public men of the twentieth century.